The front entry door of your home is very important. It is the first part of your home to greet your guests and gives them something to study as you amble up to open it, so you don’t want a door that is flawed in any way. 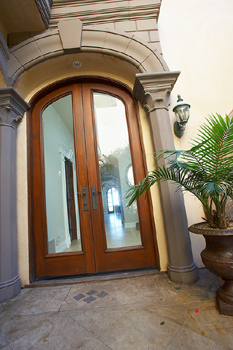 Entry doors are very important features in any home because they create first impressions. However, front doors can’t just be beautiful; they have to be strong and durable since they battle the elements every day of the year. Today there are literally hundreds of different styles of doors to choose from. There are wood, steel, fiberglass-composite and also aluminum doors, and each can be designed with decorative glass windows, safety windows, a glass side panel on one side or panels on both sides. Additional styles are double doors and decorative arched doorways. The most popular front door is created from wood, and solid-wood doors are also the most expensive variety. Although it is the most popular, it also is one of the weakest since it can warp, crack and even break over time. Fiberglass doors can resemble real wooden doors, because they can be stained to match other woods, but are much more durable. They also are virtually maintenance-free and because they won’t warp, crack, rot or split are ideal for any climate, including those with extremely hot or cold temperatures. If security, not beauty, is your main concern, then you might be interested in a steel entry door. These doors are stronger than the other varieties because they won’t warp or crack and also require very little maintenance. Although they may not be beautiful, steel doors do come in a variety of styles and are also the least expensive entry doors on the market. Aluminum doors are easy to maintain because they won’t rust and never need painting; however aluminum doors are only available through dealers and not through large hardware stores. Because they are easy to care for and are often backed by lengthy warranties, the aluminum entry door is the second most expensive type of doorway. The first step in replacing your front door is to measure your current opening. Then you need to determine what style of doorway you would like to greet your guests at the front of your home-is it one with a decorative window, a safety sidelight or perhaps double doors? Next figure out which material you would like your door to be constructed out of-do you prefer wood, aluminum, fiberglass or steel? Then do a little homework and hit some of the do-it-yourself hardware stores and check out all the different styles available to you. Before you know it, your home can be even more appealing, simply by changing the front door. « Home Selling: Should You Buy New Appliances?